Titanium dioxide (TiO2) is another cathodic electrochromic material. It has different crystal structures: rutile, anatase and brookite. Titanium dioxide (TiO2) is another cathodic electrochromic material. It has different crystal structures: rutile, anatase and brookite. Another structure, indicated as TiO2 (II), has been seen stable at high pressure and some polymorphs phases are known. However, independently from the structure, the titanium atoms are always surrounding by six atoms of oxygen and therefore the basic unit are octahedra slightly distorted of TiO6. 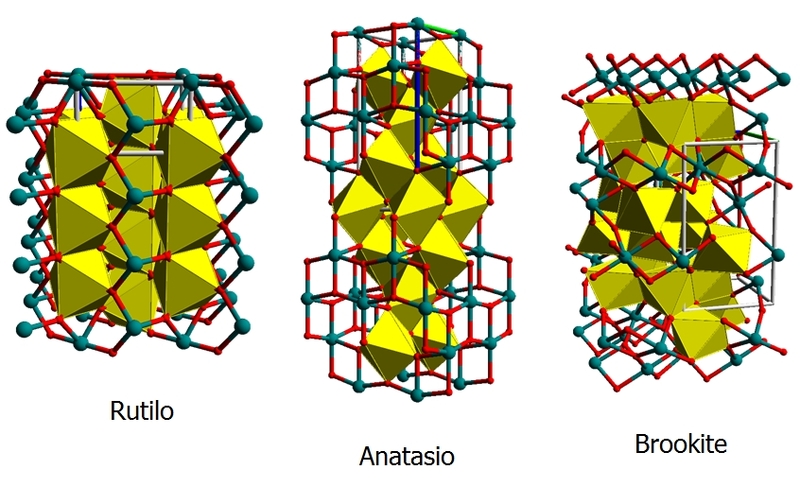 The anatase phase of titanium oxide has shown electrochromism: it has tetragonal symmetry and the octahedra of TiO6 shear two adjacent edge with two others octahedra in order to form planar double chains. The empy sites in the structure also form a double chain and their size allows to contain lithium and hydrogen ions. When anatase phase of TiO2 is treated to 900 °C it become rutile phase, that is a more stable phase, passing to an amorphous structure. The rutile phase can be described as an hexagonal close packed oxygen lattice (where the metal is always octahedrically coordinated), that forms edge shear chains that are crosslinked thus that they can form an identical numbers of empty channels that can be intercalated by ionic species. Quite different results, dependently to the TiO2 structure, have been obtained regards the intercalation/deintercalation process and they suggest that anatase type titanium oxide offers better cyclability and higher amount of ions intercalated than rutile form. For sol gel films a gray colouration has been reported but anyway the colour efficiency of the titanium oxide thin films is lower than those obtained from others metal oxide materials. This suggests that titanium dioxide can be favourably employed as ions storage layer in the electrochromic devices.